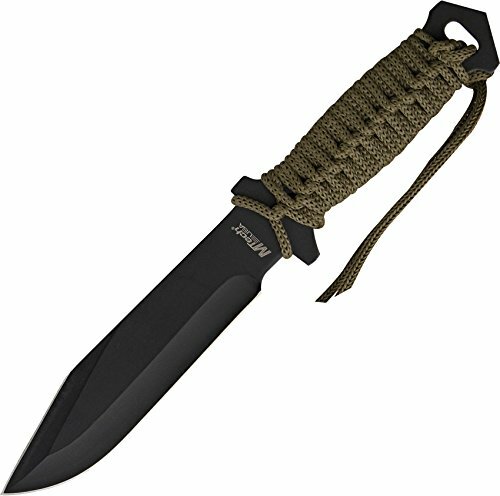 The MU-1121 Series tactical fixed blade neck knife from Master USA has a 6.75-inch overall length, features a cord-wrapped handle for an excellent grip, and includes a hard nylon fiber sheath. The black 440 stainless steel blade is half-serrated for added cutting power. The end of this full tang blade has a lanyard hole. The IZULA II is the same as the IZULA except that the handle is 1/2 in. longer and it comes with canvas Micarta handle scales. This unique knife is extremely handy and will fit in most anywhere. Whether you carry it in a belt sheath or as a neck knife, the Izula II will not disappoint you with its performance. Where did the name IZULA II come from? The locals in Peru call the meanest, nastiest ant of the jungle by the name Isula. We know it as the Bullet Ant. The Bullet Ant is known to be independent, tough, light on its feet, and a real aggressive survivor... the IZULA II knife is built the same way. This knife is designed to be the perfect lightweight survival kit or concealed carry knife. 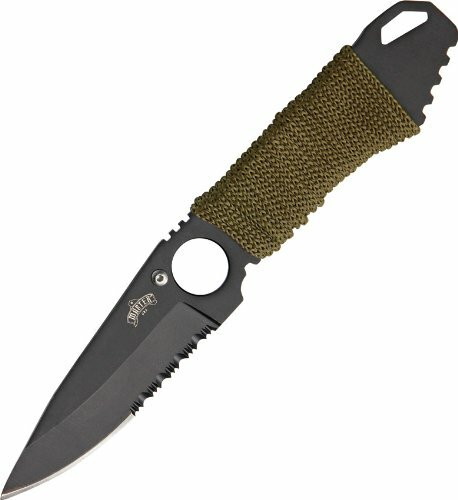 Features a high quality, wear resistant textured powder coat finish, pommel hole to accommodate carabiner, thumb grippers on the spine and each knife engraved with name, logo and unique serial number. 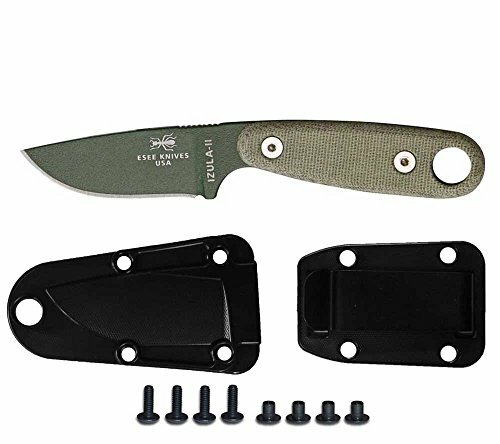 Includes: Izula II with Canvas Micarta handles, black molded sheath and Belt Clip Plate, plus screws and anchors. 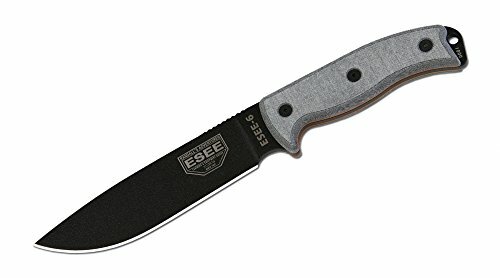 The 11.75" ESEE-6P is a full tang 1095 high carbon steel construction with an black powder coated flat ground 6.50" blade. This blade features jimping on the spine for increased thumb grip. The Handle is made out of grey Micarta canvas, with a lanyard hole in the rounded pommel. 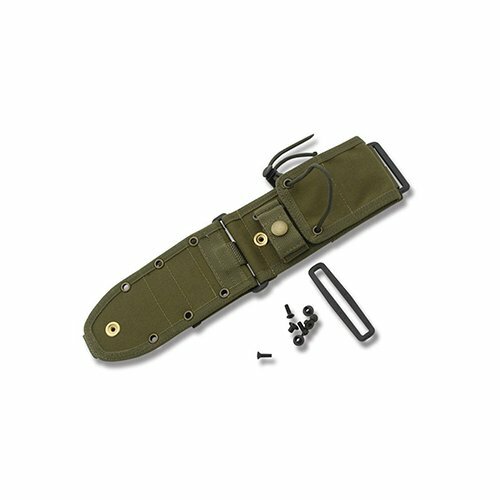 Includes durable olive drab molded polymer carry sheath with removable clip. 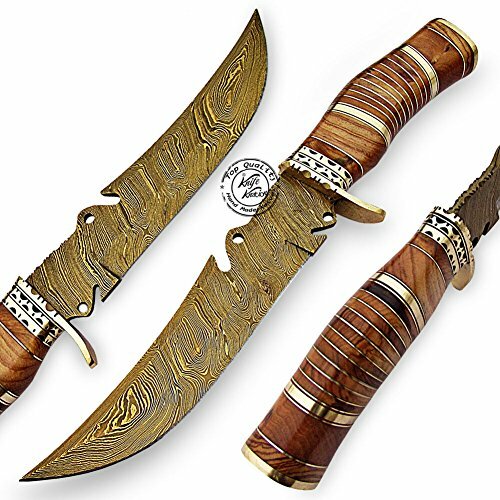 Carbon steel knives are preferred by those who want a sharp, long-lasting edge. Our carbon steel knives are made from 1095 steel. And while 1095 is a top choice for professional cutlery designed for hard use, it will rust and stain if not properly cared for - especially on the cutting edge and around the laser engraving. It is the user's responsibility to keep the blades properly lubricated and cleaned. We suggest using a dry film rust inhibitor such as TUF-GLIDE or TUF-CLOTH. 5" drop point blade with sharpened top edge at tip. 10 1/2" overall. 440 stainless black coated blade. Full tang. Olive drab cord wrapped handle. Lanyard hole. Olive drab nylon belt sheath. With the huge success of the Hoffner Folding Knife, the next logical step was to engineer fixed blades using the same "Rear Grip" and "Pivot Index" operating systems. 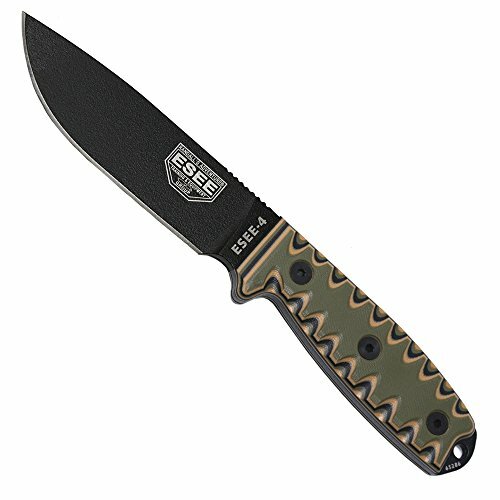 This way the operator uses the same expert reflex motor and muscle memory skills regardless of folder or fixed blade. They all go together. Hoffner Beast - This is one big, heavy, radical hunk of steel, with a 5/16" full tang spine! 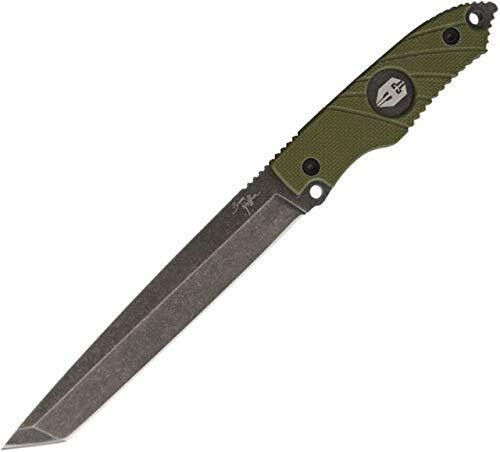 This knife is a specialty tool for first responders, rescuers, adventurists and survivalists. It does it all, as a veteran cop and active shooter instructor I know what is needed, so I built it! The Beast is an indestructible knife that will cut, penetrate, pry, hammer, chop, trench, baton, break, rake, smash, slash, crash, & trash all in its path. All this and its balanced enough to handle like a knife. The Beast is truly an outside the box knife and you are going to love it. 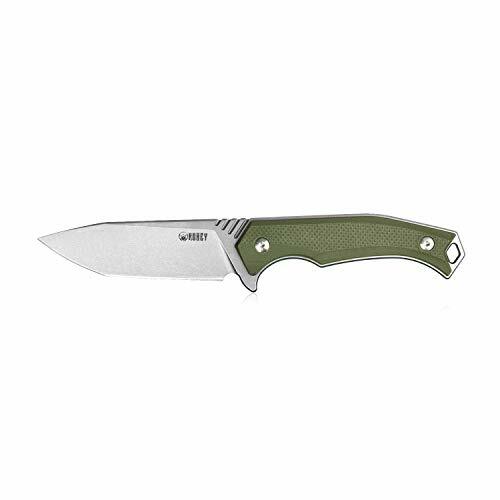 Hoffners Fixed Blades come with a stonewash black 440c stainless steel full tang blades with your choice of G10 handle and matching Kydex sheath in black, khaki, or olive green. 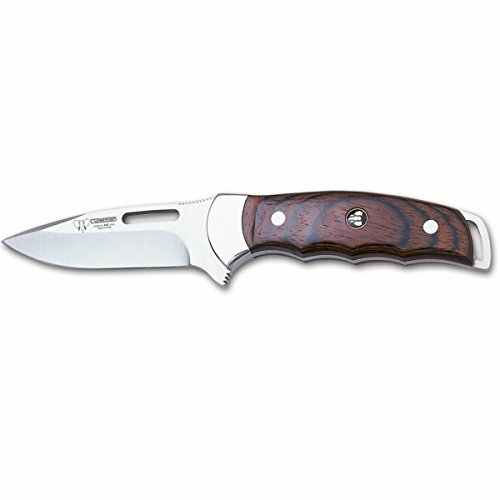 Compare prices on Olive Fixed Blade Knife at LiveSaler.com – use promo codes and coupons for best offers and deals. We work hard to get you amazing deals and collect all avail hot offers online and represent it in one place for the customers. Now our visitors can leverage benefits of big brands and heavy discounts available for that day and for famous brands. We try to makes comparison shopping easy with Product Reviews, Merchant Ratings, Deal Alerts & Coupons. Find Deals, Compare Prices, Read Reviews & Save Money.